It always comes as a surprise to those who begin to study Dante, that most Catholic of poets, that he places no less than three popes in hell. One may think that those popes were corrupt unrepentant sinners, which they probably were, and were there to receive their just desserts, but that is not the real reason why they are there. 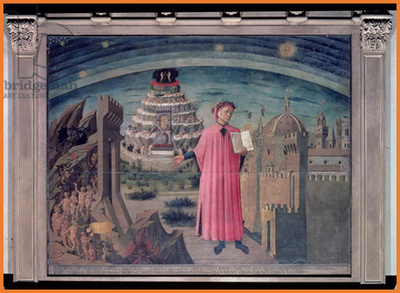 Dante places them there, in the circle of the simonites (see cantos 18-23; circle 8 of the Inferno), because they had failed to distinguish and keep separate, in both practice and theory, the temporal and the spiritual. They had declared the pope superior to emperors even in the temporal order. Dante even identifies the root cause of such a false doctrine; he traces it back to the donation of Constantine in the fourth century AD, which turns out to be a false document assigning temporal power to the popes in Rome. To better understand the rather thorny issue of the separation of Church and State, the temporal and the spiritual, it may be useful to keep the above preface in mind as a sort of framework or paradigm. So, jumping to the 21st century, we see the issue alive and well, of all places, in Russia which under Soviet times privileged atheism at the expense of traditional Russian Orthodox religion, where the opposite of what was happening in Dante’s 14th century is currently taking place: the state and the church exploiting and using each other as they claim equality in their respective spheres. 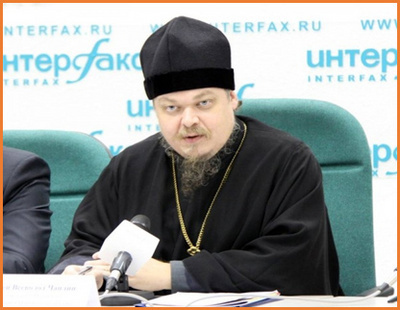 We now have there a Russian Orthodox archpriest who is a religious advisor to Vladimir Putin who, since his days as a KBG operative has found religion and his ancient Christian roots, but a religion of a special kind, it is not even Orthodoxy per se, it is the Russian kind of Orthodoxy. Chaplin’s mentor Patriarch Kirrill, has de facto become part of the political Kremlin bureaucracy, a minister of religion without portfolio, residing in the Kremlin. But the advisor I am referring to is his protegee, Russian Orthodox archpriest Vsevolod Chaplin whose ideas, as enthusiastically approved by both Putin and Cirrill, we shall briefly investigate in this piece within Dante’s paradigm. To be sure, the kernel of truth in such a bizarre stance, as exemplified by the quote above (whose other side or immediate response is the call to jihad or religious war by the ISIS spokesman, as the second quote reveals) is that indeed religion, when not abused and exploited for temporal purposes, has always mitigated the most savage leanings of humankind, especially the perennial ones of imperial dominance and struggle. But those quotes also reveal the other side of that coin. Putin is well aware politically that 70% of Russians identify as Orthodox Christians nowadays, that the days of official Soviet atheism are over; as such he wants to make sure that he can rely on the Church to bolster public support for his new ventures on Syria now that he has put aside the Ukraine and Crimean crisis; or perhaps to promote distraction from them. He has even received the loyal support of Patriarch Kirrill who has described Putin’s decision to venture in Syria as protection generously offered the Syrian people from the tyranny of terrorists. Never mind the psychopath Assad who has already murdered 300,000 of his own people and provoked a refugee crisis in the EU. With that kind of “holy” approval Putin has jumped from 14% support for military action in Syria in September, to 72% in October. Who cares about the West’s sanctions due to the usurpation of Crimea, or for that matter, the Russian constitution which clearly stipulates the separation of Church and State. Indeed, if there ever was an example of the convenient mixing of the spiritual with the temporal in modern times, this is it. One can easily change the name Chaplin to Putin under the first quote above and one would not know the difference. Putin goes around praising the deep faith of the Russian people; something he did not do when he was KBG operative. We can easily imagine where Dante would place Patriarch Kirrill, archpriest Chaplin, and President Putin never mind their vaunted Christian piety and their condemnation of a decadent corrupt West being punished with terrorism for its corruption. In any case, some two weeks later, on Oct. 31, a Russian passenger jet full of vacationers returning home from a popular Egyptian Red Sea resort broke up in midair, killing all 224 people on board. Then there was the Paris attacks. They all played into Chaplin and Kirrills narrative of God’s punishment for sin. And the a few days later there was the Nov. 24 downing of a Russian jet by the Turkish military. The question of course arises: whose sins are being punished? Nevertheless, today, Chaplin is considered the unofficial leader of Russia’s increasingly visible and at times violent Orthodox Christian radical activists, who have attacked gay rights activists and vandalized “blasphemous” art exhibitions in Moscow. The kind of people who in some way resemble the radical activists of Islam; they both want a pure orthodoxy of sorts. In 2012 as the Kremlin geared up to introduce a law banning American families from adopting Russian children, Chaplin justified the law by declaring that children brought up in the United States would be unable to receive a “true Christian upbringing and would be barred entry to the Kingdom of God.” Wow! Here again we see the incredible confusion between a war of religion and a war of civilization misguidedly promoted to the nth degree. It appears that such rhetoric is completely acceptable nowadays not only to the church but to Russian society in general, never mind the consequences; consequences such as a declaration of jihad by the Muslim North Caucasus and the Chechnya regions against Russia; not to mention the deadly attacks by ISIS who have already threatened more terrible atrocities inside Russia. Finally, what are we to conclude from the above political-religious analysis? To answer the question we need to return to Dante’s insight. That insight is basically this: that he had it on target some 700 years ago when, by placing three popes in hell, he warned us of the fallacy of mixing the temporal with the spiritual in a symbiotic-mutual-exploitation relationship. That kind of relationship usually ends in catastrophe and tragedy. The beauty of the Divine Comedy is that it does not end in tragedy and that’s why it is called a comedy. Archpriest Chaplin, as a Christian that he claims to be, would do well to peruse it and perhaps consider changing his mind on the misguided mixing of the temporal with the spiritual that he exhibits so disingenuously. Genuine religion, not only avoids that confusion but it is also able to transcend the temporal and the contingent without denying the eternal and the absolute. A St. Francis of Assisi teaches us that it is possible to arrive at the transcendent via the immanent by respecting life in all its splendor within nature right here on earth. We do not need jihadist war or crusades. We know where those ultimately lead to: to death and destruction. Death and destruction, even of the contingent, leads to death and hell, even here on earth. Dante has taught us that much, if nothing else. He has taught us that a religion unable to distinguish the temporal from the spiritual, or a religion subservient to the temporal, is ipso facto a pseudo-religion, ultimately doing more harm than good.